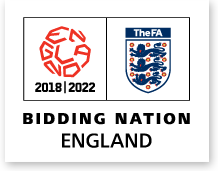 But in an example of a sport bidding process gone made, not only is England bidding for the World Cup, but English cities are bidding to be part of the World Cup bid. 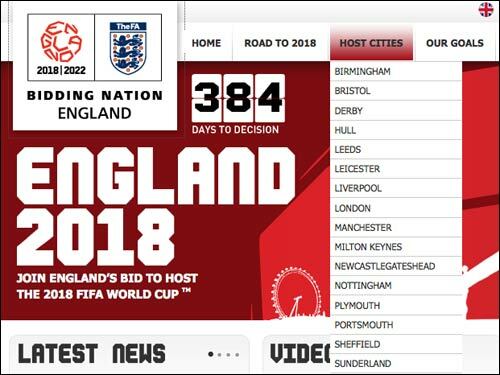 16 cities, including the somewhat unlikely choices of Milton Keynes and Plymouth, are attempting to be part of the English FA proposal to FIFA. This is frankly ludicrous. The idea that London or Manchester need to campaign to be included in the bid seems an astonishing waste of effort. Visit England's Northwest, for example has a digital campaign website for Manchester's bid, whilst the list of contributors and stakeholders in Sheffield's bid boggles the mind at how much time and money is being expended by those public bodies. It was all so much simpler in the old days. 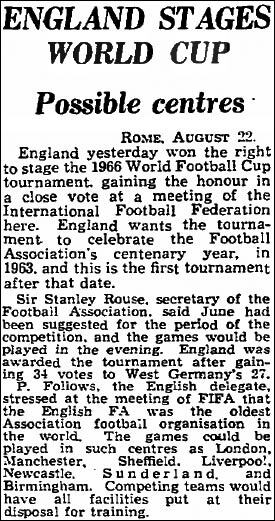 England were awarded the right to host the 1966 World Cup in a process that the country barely seems to have noticed. 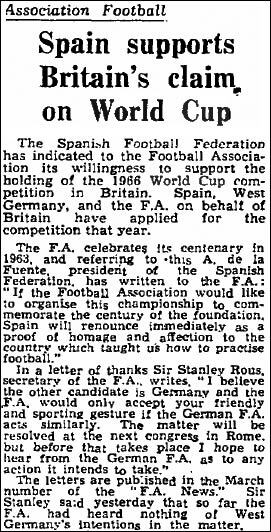 In the March of 1960, The Guardian carried a report that the Spanish FA would support a World Cup in England. Note the synonymous use of Britain meaning England in the article! According to our digital archive, neither The Guardian nor The Observer mentioned the bidding process again until the FIFA meeting in Rome made a final decision. Some 6 years before they would meet in the final, England pipped West Germany to hosting the tournament in a close vote, 34 to 27. At this stage, the FA had not even decided which stadiums would be used. 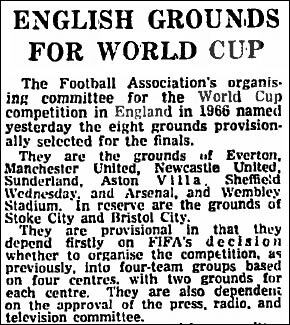 This wasn't announced until November 1962, when Arsenal, Aston Villa, Everton, Manchester United, Newcastle United, Sheffield Wednesday, Sunderland were named as provisional hosts alongside Wembley. That provisional list turned out not to be accurate. For the actual tournament, Middlesbrough's Ayresome Park replaced Newcastle as a venue, and Arsenal's Highbury didn't feature at all. In fact, the second London venue used was White City's Olympic stadium. This hosted just one game, Uruguay vs France on July 15th, because Wembley's owners were unwilling to cancel their regular greyhound meeting that day to accommodate the World Cup. By Martin Belam on 18 November 2009. The internal "city bidding" is indeed ludicrous — take a look at Birmingham's effort which has included a lot of press campaigning too. Three – Wembley, Arsenal’s Emirates and Chelsea’s Stamford Bridge are in London, two are in Manchester, two are in Liverpool. Which actually leaves only seven stadia (in six cites) able to host games at the moment. Horrific waste of time and effort. If bidding for the world cup requires having to "treat" (really we should be saying bribe) FIFA officials to gain the world cup, I think we should refuse to play in the world cup let alone host it. It's a outrage, pure corruption. Sport should not be about money but the way Football in particular is going it is all that matters these days. @Jon Bounds. Why wouldn't Newcastle's St James' Park and Sunderland's Stadium of Light be fit to host World Cup games? Luckily Portsmouth Council spent money on a 'Back the bid' website before deciding the whole thing was too risky and pulling out. This is a typical "English" blog, we are trying to do something amazing for the country and we can only moan about it. We have the grounds the infrastructure and most importantly i feel the passion to hold a world cup. If South Africa can do then surley to god we can. 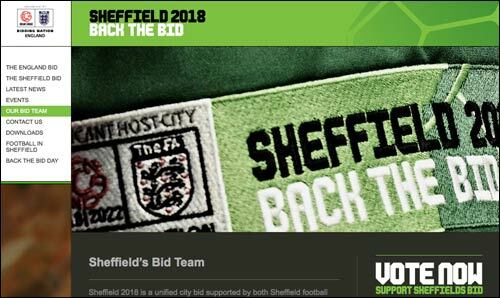 Come on everybody back the bid!